Sponsored by Oldham Council and Community 1st Oldham, students on the National Diploma Fine Art course at Oldham College created a mural based on the themes of health and well-being, fitness and sport, and the historical features of the old Chadderton baths and library which the new centre has replaced. The ideas for the mural were created following a series of family art and reminiscence workshops held throughout the summer which captured a range of local people’s memories and experiences of the existing Chadderton Library and the now closed swimming pool. 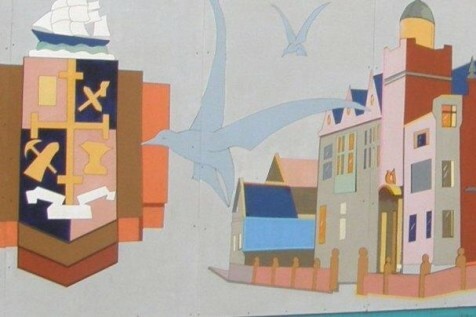 These ideas were then created into a giant painted mural which covered the hoardings of the construction site until the centre was completed in Autumn 2009. Steve Langwieser, curriculum manager for the National Diploma, said: “The Oldham College is proud to continue to be involved in this arts and community involvement programme. Our National Diploma students have enjoyed being part of creating these murals and were proud to see their work in Chadderton”. This exciting project was sponsored by Oldham Council and Community 1st Oldham as part of an ongoing arts and community involvement programme, which aims to promote the talents of local people in Oldham and improve local community ownership.